permanent Upper Nepean Scheme pipeline. In 1888 the temporary infrastructure was dismantled. 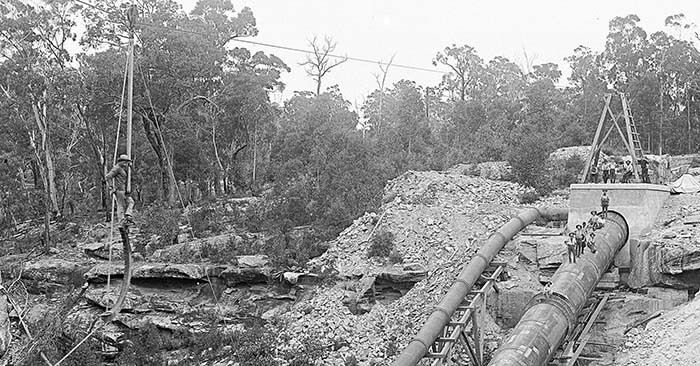 Before the Upper Nepean Scheme could be completed, Sydney was gripped by another drought. In 1885 the Lachlan and Botany swamps were down to about 10 days' supply and the city council asked the government for urgent help. With Prospect Reservoir only half finished, the Upper Canal still unconnected by pipes across gullies in many parts, the situation was desperate. The Minister for Public Works seized on a daring temporary solution proposed by a local engineering firm, the Hudson Brothers (who later became Clyde Engineering, now part of Downer). "Mr H. Hudson had suggested to the Government that the gaps in the 'waterworks' between gorges should be connected by timber fluming, and that he guaranteed bringing 3,000,000 gallons of water a day to the Botany Dams at a cost of 60,000 [pounds]." That's 13.6 million litres of water a day in today's measurements all delivered to Botany Swamps within six months - a mighty promise to deliver on! With its back against the wall, the government immediately commissioned the scheme. In just six months of frantic construction activity, the Hudson Brothers built 16 small concrete dams along the Upper Canal and laid 1200 giant cast iron pipes, bridging eight creeks in rugged locations and crossing the Great Southern Railway line near Menangle. Even more remarkably, between the Lower Canal at Guildford and Botany they built three kilometres of open timber fluming on timber trestles, some of them 21 metres high. On 30 January 1886, the Mayor of Sydney and the Minister for Public Works officially turned on the flow of Nepean water into the Botany lakes. "The real merit of the work consists in it having removed all danger of a water famine."